Viola Bernadean Jeardoe, was born October 16, 1930 to Emery Eugene and Nellie Carrie (Horkman) Awalt in Republic County, Kansas. 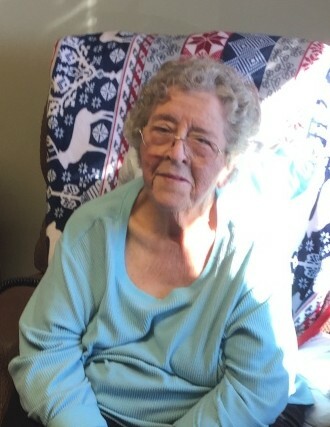 She passed from this life Saturday, March 16, 2019, while living at Sunset Nursing Center in Concordia, Kansas, at the age of 88 years and 5 months. Following graduation from High School, Bernadean was married to Pearl E. Jeardoe on June 6, 1948, in Belleville, Kansas, and they made their home in the Talmo area. During her life, Bernadean worked various jobs, including Sunflower Grocery for Bob and Shirley Danielson, Belleville Locker Plant for the Blackwoods, Everett’s Hardware Store in Concordia, and cleaned homes for many families in the area. Bernadean also helped clean the home for her Grandma Cowle, who paid for her piano lessons. On the farm, Bernadean helped in the farm work, and always put a garden out, and canned fruits and vegetables during the summer. Bernadean also enjoyed babysitting for countless numbers of children over the years. Together, Pearl and Bernadean raised five children: Gary, Randy, David, Jesse, and Trudy. She was a homemaker and loved her family dearly. She will be forever remembered by her children; Gary and wife Jacky of Concordia, Kansas; Randy of Assaria, Kansas; David and wife Karla of Belleville, Kansas, Jesse and wife Jane of Belleville, Kansas, and daughter Trudy Beam of Neosho, Missouri; sister Ardith Thomas of Saratoga Springs, New York; 18 grandchildren; 27 great grandchildren, and one great, great granddaughter. She is also survived by several nieces, nephews and many friends. She was preceded in death by her parents; husband of 62 years Pearl Jeardoe; son James Anthony Bell; grandson David Matthew Jeardoe; brothers LeRoy and Martin Awalt. Visitation with family greeting friends will be on Friday, March 22, 2019, from 5:00 pm to 7:00 pm, at Tibbetts-Fischer Funeral Home in Belleville. Funeral Services will be held at 1:00 pm on Saturday, March 23, 2019, at Tibbetts-Fischer Funeral Home in Belleville, with burial following at the Zion Cemetery, rural Talmo, Kansas. Memorials may be made to the family’s choice. Tibbetts-Fischer Funeral Home assisted the Jeardoe family with these arrangements.